Derek Butcher 12/17 ... "Chris, I think you got an offset from me and mine has never performed. One with this name has flowered white with blue spots, as Len can confirm, to add to the confusion." Len Colgan 12/17 ... "Derek is referring to the other plant I collected and I refer to as T. aff yuncharaensis. I collected it a few kilometres from Yunchara, and there is a possibility it might be a natural hybrid with T. xiphioides as the other parent. Who knows? I have distributed a few of them, including one to Eric Gouda who successfully flowered it. It is also fragrant." Eric Gouda 12/17, Curator Utrecht University Botanic Gardens. ... "I think I got a plant like this from Len. 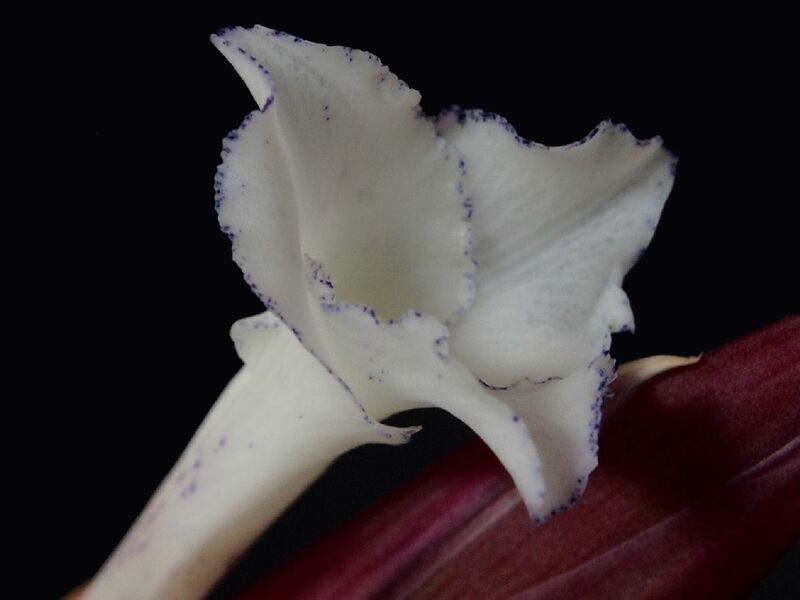 It flowered with white petals and blue margins, very nice, but only flowered once." Derek Butcher 11/18 ..."Julie Batty in Adelaide has done it again. Let us go back to 1993 when Len Colgan circumnavigated Bolivia. He collected "Colgan 5" near Tojo which is near yunchara which is why it got linked to yuncharaensis. In 2001 Eric Gouda in Holland flowered his piece and took it to bits to describe it as cf yuncharensis but did nothing further. I was still waiting for my specimen to flower!!!. So it was a hell of a surprise when Julie sent me the attached photos. Clearly T. xiphioides is involved AND it is scented too. I consider this a great plant to own and have a name recorded rather than just cf yuncharaensis. Is it still found in the wild? We do not know but we do know it is in cultivation in Holland and Adelaide. So now you know why I am pushing for it to be formally recorded as cultivar ' Tojo'." Len Colgan 11/18 ..."Yes, Derek, a most unusual plant. Well done Julie! I thought it was T. yuncharaensis when I found it, but that plant species has blue/purple flowers and red bracts, whereas this has white flowers with blue/purple spotting and dark red/violet bracts, as can be seen. Both plants are long caulescent, but this one has shorter leaves than T. yuncharaensis. I have distributed specimens widely, and so many collectors would have it. I have always guessed it might be a natural hybrid of T. yuncharaensis with T. xiphioides, due to the spotting. But, who knows?" Derek Butcher 11/18 ..."Those who have T cf yuncharaensis from Len can look forward to a great flowerer(when it does its deed!). Please put 'Tojo' on the label." 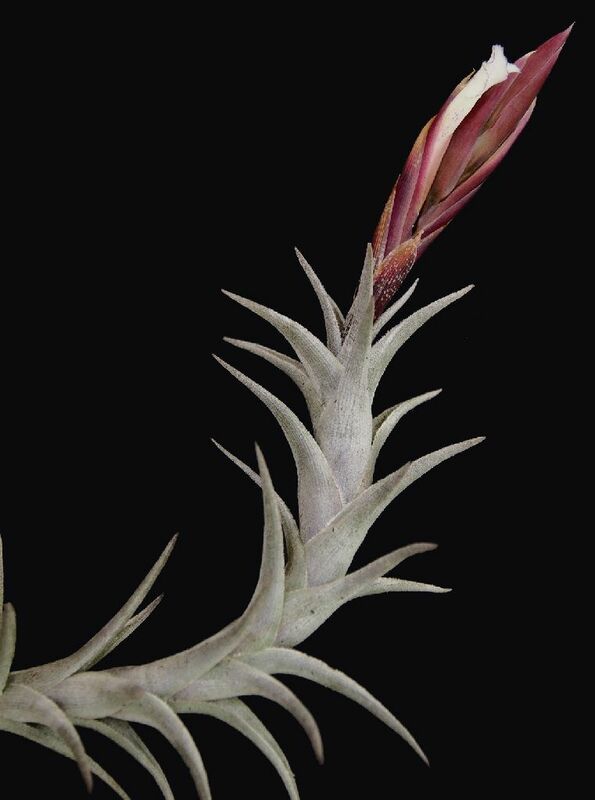 In 1993 Len Colgan circumnavigated Bolivia looking mainly for Tillandsias. He collected 'Colgan 5' near Tojo which is near Yunchara. It was not in flower but because T. yuncharaensis had already been published it seemed logic to link this collection with this taxon. He sent a piece to Eric Gouda in the Netherlands and in 2001 it flowered there. Eric wrote up a description and did a differential, comparing it with T. yuncharaensis but did nothing further. Len had given me a piece of 'Colgan 5' but my plant did not want to flower. In November 2018 Julie Batty in Adelaide got hers to flower and took photos. The flower was white and the petals had the shape of T. xiphioides but with blue edges AND it was scented too. 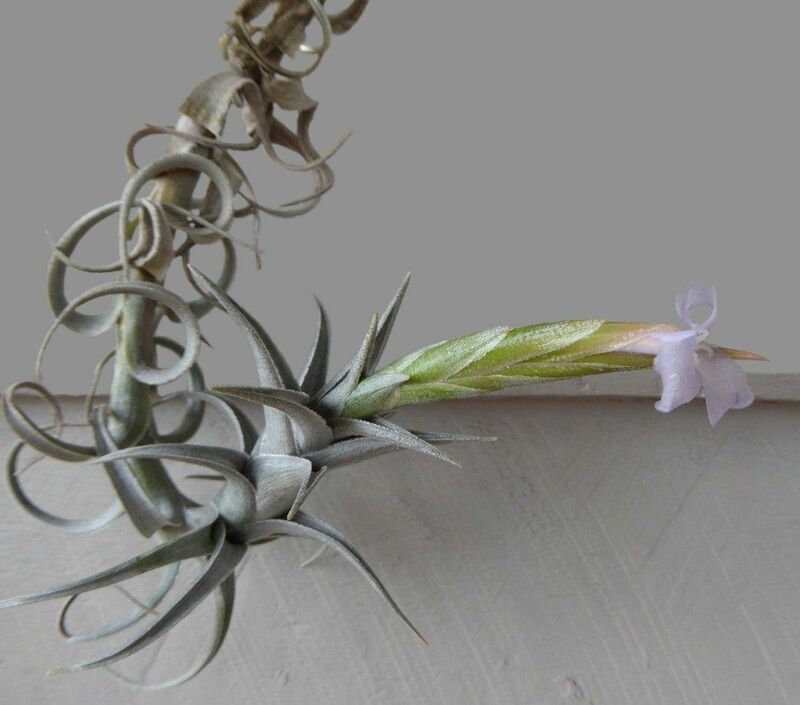 For such a stunning flower it seemed a shame to call it Tillandsia cf yuncharaensis and unrecorded. Was it a natural hybrid or a new species? Is it still found in the wild? We do not know but we do know it is in cultivation in the Netherlands and Adelaide. 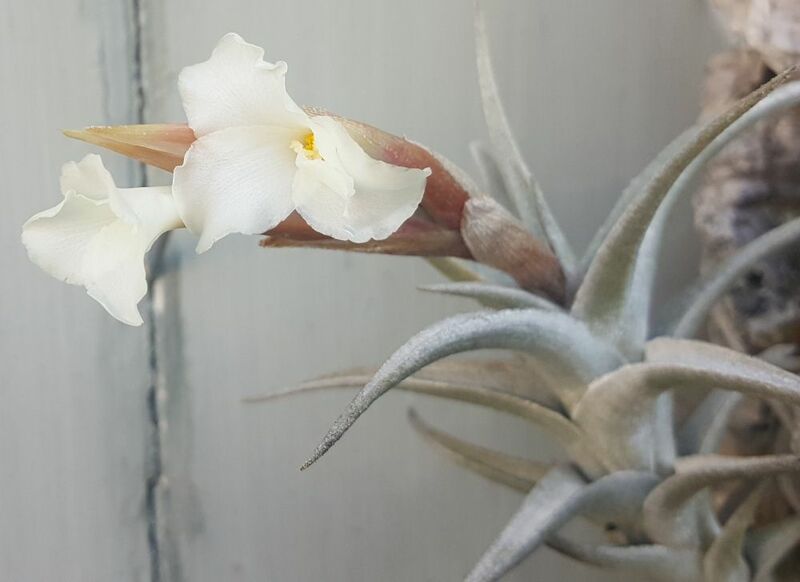 17 years has elapsed since it first flowered and it has not been described under the ICN rules. It seems prudent to treat it as a Cultivar ‘Tojo’ to link with where it was found. It differs from T. yuncharaensis by the plant having leaf sheaths very densely lepidote outside, glabrous inside, purple-red. Blades arching, strongly channeled, 1.4-1.5 cm wide, very densely lepidote, with subappressed scales. Peduncle 4-5 mm in diameter. Peduncle-bracts much exceeding the internodes, purple. Spike strongly complanate, lanceolate, 1.2-1.5 cm wide. Floral-bracts finely nerved, red, or purple. Sepals acute or slightly apiculate. Petals with the blade recurving, the blade 1.3 cm wide, bi-colored, creamy with blue margins.